la porte rouge: a novel, when friends do amazing things. a novel, when friends do amazing things. When my dream of living in a house in vermont was coming true, my dear and talented friend Corine (who made my dream possible) was having one of hers come true as well, she published her first novel Hidden In Paris. Corine is one of the funniest sincere bloggers i know, her blog Hidden in France was one of the very first i followed so to see what i so admired in her blog- her writing be put in a novel one that does not require me sitting at a desk to read but instead curled up by the fire while turning it's pages in anticipation well that was just heavenly! i asked my dear friend if i could ask her a few questions about Hidden in Paris and she happily accepted. She will be giving one lucky reader a copy of her book just leave a comment below and the winner will be announced one week from today. I say why wait when you can buy it here right now. if you would like a sneak peak into the novel itself you can find that over here! I am so excited to finally be able to share this with you, merci corine! 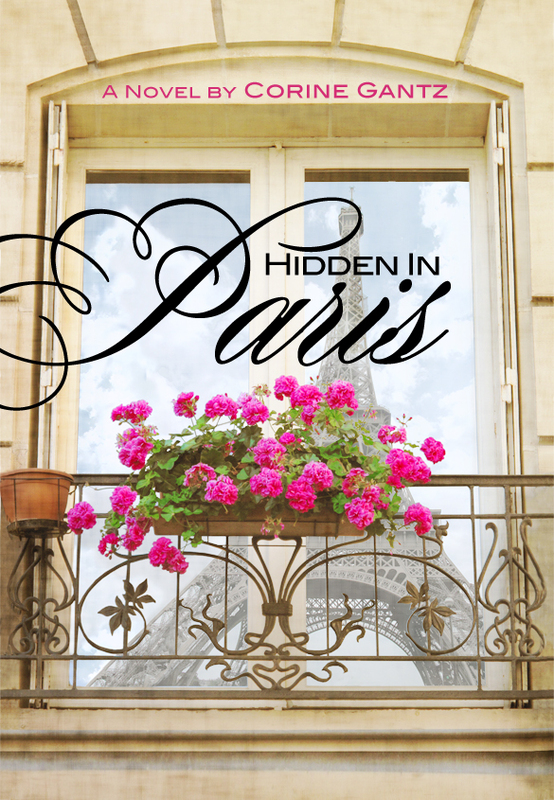 Hidden in Paris by Corine Gantz. Thank you so much for allowing us to share a bit about the behind the scenes of the making of Hidden Paris. la Porte rouge You are a a french woman living in the US writing about an american living in France, did you find it difficult to do so. would you relate more with the main character of Annie, now that you are living an american life? Corine When I go to France I really see it with brand new eyes: my new, fresh American eyes. I am so surprised with the way French people are, and so amused by it. At the same time I know it’s all a question of ceremonials. Americans are very direct in their interactions with strangers, the French are more circumspect. A certain form of politeness, even decorum is hugely important not to offend. I think Americans study the way they are supposed to behave when they visit countries in Asia, India or Africa. But I feel some Americans don’t think to look up the behaviors expected in European countries because they assume it should be the same as in the United States. I’ve received some angry reviews because my character Annie lives in France and criticizes it abundantly, but that’s because she feels French. Her criticism has been seen as French bashing, but no one is more critical of France than the French themselves. la porte rouge How much of you is in this book, do you relate with one specific character, are you in all of them or none. Corine Annie is opinionated, makes rash decisions, is blind to a lot of things and acts like a wounded person trying to protect herself. Lola rather put her head in the sand than face unpleasant things, and Althea has found ways to turn her anger at the world against herself. They all need to change and all need to heal. I can relate to every one of those bits. At the same time, Annie is spirited and funny, Lola is kind-hearted and Althea is artistic. Those are qualities I value and hope will rub off on me some..
la porte rouge Did you have to do any research about paris and places or did you reach into your past. if you could be in one restaurant or cafe, street or park right now in paris where would be. Corine Some places have left great impressions on me. Last summer I made a point to revisit most of the locations mentioned in the book to see if they matched my descriptions of them. They didn’t always but in the end I decided to keep with the memories rather than the reality. It was much more pleasing to me, after all I am no journalist, I write fiction and part of me rather live in fiction too. la porte rouge your main character annie loves to cook, do you cook? what will you be cooking tonight? Corine I’m hard at work writing the companion cookbook to Hidden in Paris, but all my recipes are in my head, so I need to recreate them in order to note the ingredients and measurements. As we speak I have brioche rising on my kitchen countertop. Looks like we’ll be having brioche for dinner and little else. I’ll come up with something. When I’m not hungry nothing inspires me, so nobody eats but when I get hungry I get to the stove in a hurry. Lately I’m all about Indian spices. I like to try all kinds of wild things. My highest culinary aspiration is to one day go meatless… but I am weak. Corine I am not into clothes at all and have no opinion on designers. I had to google the stuff. I do buy clothes in the hope that it will make me look better but it never does. The fact that my designer of choice is old navy might have something to do with it. I can’t spend money on expensive clothes because I will get bored with them and they won’t make me look any better than the cheap stuff. Same with Jewelry, hair and makeup. I just don’t know how to adorn or pamper myself. But I do have emotional attachment to a few items of clothing from years ago. Some things I bought for myself, by myself with my own money when I was very young and just learning to be myself. I don’t wear them, I just can’t part with them. Corine This was not easy for me because I had to come to term with the fact that I needed my happy ending when the books I really love and admire are those that break my heart. I fought my happy, but in the end I was weak. la porte rouge do you still think of your characters now, what would annie be doing right now ? Corine My characters are very real in my head, and as was writing my second novel I keep finding them lurking in disguises in new characters. I had to yell at them and tell them to go away. This new story was not about them, I said.. but they seemed to keep coming back through the back door. I’m told a lot of writers have that problem. Thank you Dear Nadia for listening to me. You and I are connected through more than blogging and our love of books now. Your creativity, personality and style inspire me so much you might find yourself in one of my stories one day. LMT- you are the winner of the novel Hidden in Paris by Corine Gantz , please send me your mailing addtress! Oh wow! sounds like a book I would love to curl up with- Congratulations Corinne! And thank you both for the delicious preview, insights, and the chance to win a copy of your book. And what a gorgeous cover! What a fantastic interview! This book sounds wonderful, I will have to put it on my Christmas wishlist. Thank you for sharing it with us! I discovered this an hour ago and rushed to create a little post all about you dahhling! xoxo! Nice interview ... which Corine always seems to give. I thoroughly enjoyed her book and look forward to her next. Will she autograph the winner's copy? Thank you for posting the interview. Congratulations Corine! It’s really interesting to learn about your writing process, and your friendship with Nadia, and the mutual admiration, is touching. As a fan of Hidden In Paris, I found this interview so very interesting. Thank you. How lovely! I must read this! And, how fun, this interview. One more book on my looong reading list! Thanks for making me discover. I found the first question very interesting, seeing someone else do exactly what I do when I travel between my three home countries. Thank you for the interview, I think it would be a very interesting book to read. J'aime! Je veux le lire....please! unless otherwise designated, all text and photographs on this blog are the copyrighted material of laporterouge and its author, or are used by permission. you may use or link to material on this blog provided you include proper attribution. thank you.